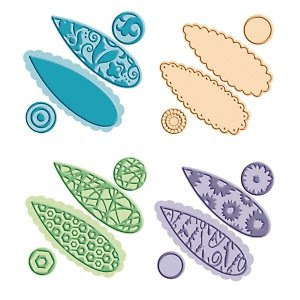 Okay, the Cuttlebug die and embosser actually calls it Build-a-Flower but I thought I might be able to make some unique fish with the shapes as well. Flowers and dragonflies are a natural with these fun and pretty designs but I'm feeling a little fishy! I cut the tails by hand, added some details with a fine point sharpie and some jewels for eyes. I also modified one of the scalloped design for the one fish...there really is a lot of potential for variety! Hi Laura, neat idea! The fish are so glamorous!